If you love traveling the great outdoors and need a smart, affordable vehicle to transport you and your many pieces of gear without hassle, the Element will work for you. It is dependable. This car will last forever and it never gives me any problems. I have always loved this particular vehicle. When it came to shopping for a new vehicle to purchase this was the first and last that I looked at, and test drove. I was drawn to the style of the car and it is unique shape and then the color. My model is and "sc" edition. These models only come in a few select colors, and I chose "root beer metallic". It is different and sleek. I love the way it drives and takes to the road. I like the way their doors open to the back in a "suicide door" style. It is super roomy and the seats are foldable and can make two complete beds. It is great on gas in town and highway driving. I have never had any major problems, only normal wear and tear. I love my element!. Element versatility and its many uses. Love the versatility. I live an active lifestyle and it works for everything I love doing. It has lots of cargo space does amazing off-road and in the snow. I love taking it camping and connecting the tent to the cargo area. When I travel the seats fold down to make a comfortable bed. It's easy to keep clean. I wish it had just a little more engine power is my only complaint. Otherwise I love my element. The car does provide a lot of space and drives smoothly; however, it does not drive the best in windy environments. I'm not sure if that's because of the size and shape of the car, but it is still a great car. 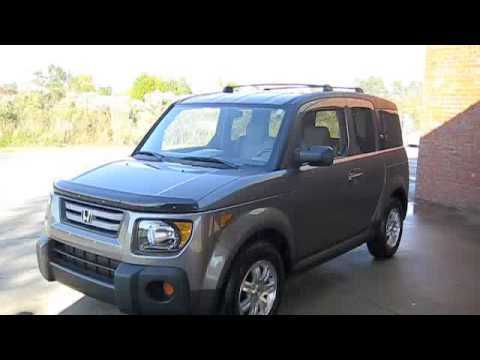 My Honda Element was my first car and I've been driving it regularly for about 7 years now. The car drives incredibly well and has far more space than you would anticipate. The only downside I really feel about the car is that it only seats four as opposed to five. Other than that, the car rides smoothly and I have had no mechanical problems throughout the life of the car. DOPE, INC. WILL NOTIFY OWNERS AND OFFER A FULL REFUND FOR THE NONCOMPLIANT COMBINATION LAMPS. THE SAFETY RECALL IS EXPECTED TO BEGIN DURING MAY/JUNE 2009. OWNERS MAY CONTACT DOPE, INC. AT 1-626-272-1798.